Michael Hohl and I started writing notes for research students on how to set up their computer so that it works well for writing and research. I have developed these notes further, and Michael’s website has very useful advice on organising workflow, folder structures, etc. The notes below concern software and on-line tools that support writing, research and collaborative working. Whether you’re working on a thesis for a PhD, or researching for a book or major project, you need to set up your computer in a way that makes it easy to store stuff, find stuff, and sort stuff out. If you get a system sorted right at the start, then the whole venture should work almost by itself. The specific software you need will of course depend on what research you’re doing, and your preferences. It is worth trying different things out, as what works for one individual will not necessarily work for another – we all have different ways of thinking and working. It could be that you are working on a team project, in which case you will need more tools for collaborative working. What follows below is not the one true way, but some guidelines and starting points that have been shown to work. The software recommendations are for a Mac. We may add PC recommendations in time, but to be honest if you’re using a PC you’re only making things difficult for yourself (in our view). But as we say above, it’s all about personal preference. There are a number of sites that recommend “the best OSX freeware and shareware”, which are worth checking out. Most of what we recommend costs money, but it is money well spent, and in some cases represents a very modest cost. There are some great independent software authors out there producing some very good tools. Michael’s workflow notes explain how he has done this. His advice on how to handle files and to keep old versions of files is absolutely essential. His notes also refer to issues below, which I have edited somewhat, added additional details and provided weblinks. You should identify a core group of applications that do the things you want to do, work well together and that you feel comfortable with. Much of what I do involves making notes, organising notes, organising ideas, writing stuff up and presenting ideas as written documents, presentations, blog entries, etc. In the past I would have used Word for much of this, but now I use a combination of tools – each of which is great for a particular task. The age of the word processor may well be past. Different stages of the writing process (and different types of writing) require different tools. xPad – is an extremely useful notepad application. It opens fast, saves automatically on exit, and provides an ideal way of taking brief notes. And it’s freeware. Voodoopad – according to its producers “is a new kind of notepad. It’s like having your own digital junk drawer where you can jot down notes, web addresses, to-do lists… Anything on your mind. VoodooPad automatically links each page together, to form a miniature world wide web, on your desktop! Type in your notes, and highlight important words or phrases to create new pages; or drag and drop folders, images, applications, or URLs into VoodooPad – they’re linked up whenever the word representing it is found.” Michael uses this wiki-authoring tool extensively in his work. I’ve found that it takes a little time to get used to using it, and to appreciate its potential, but Voodoopad is a very useful application that helps to stitch together bits of writing, references, notes, files you’re working on, and weblinks. In short, extremely useful for research and writing. 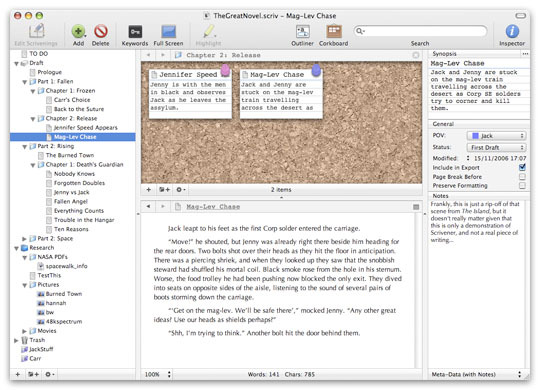 Scrivener – is a great writing tool that fits very well with the way I work and is worthy of serious attention. It is cheap, but comes with a one month free trial. I tried it, bought it, and reckon it’s the best 20 pound’s worth of software on my machine. You set up a project folder and pile in all your notes, documents, pdfs, images, etc. If you use an outliner, it’s got one of those, and a ‘corkboard’ system of organising ideas and, of course, a text editor. It provides a contained environment to think and write within. If we think that a word processor is a typewriter, then Scrivener is your whole office – in short, an ideal writing tool. At the end of a project you can export the text as a RTF file, which can then be formatted by Word, Pages or whatever else you use. I’ve used this for two years, on various projects from short articles to book chapters and reports. The software has been put together by a writer, which is probably why it works so well. Brilliant, elegant and intuitive. Journler – Essentially it’s a diary based editor which could be good for organising meeting or project notes. It has a facility to export directly to your blog, which would be great if it supported WordPress or Blooger, which it currently does not. However, even as a self standing journal it is very useful, enabling text, audio, video and images to be woven together easily, and it integrates very well with Mail and iWeb. As an application to support the reflective journal of a research student or research-based practitioner, it is worth trying. On the upside, its integration with OSX is great. On the downside, it is limited as a blogging tool. It used to be “donationware” but now a student licence will cost around 15 pounds. Omnigraffle – provides a powerful tool for mindmapping (and graphics) books, concepts, ideas, website structure, and the thesis as a whole. Macworld reviewed it by saying: “…this fantastic program is a revelation for anyone who needs to explain processes and concepts visually”, which makes it worth a serious look. Keynote – the latest version is far more versatile and flexible than Powerpoint. Michael uses it “for ALL my graphic design needs, doing graphs, charts, diagrams. You can save as pdf or ppt or movie.” The advantage over Powerpoint is nothing to do with all the fancy transitions and effects, but rather its integration with other mac packages, its clear interface, and ability to produce and edit graphics. Graphic Converter – is a more straight forward alternative to Photoshop, is shareware, and does just about all the things you would need to do in terms of manipulating images. It’s much easier to learn than Photoshop. As Michael explains, you can produce graphics in Keynote, save them as a screengrab then with GC, “turn them into jpg or png for use on website, thesis, presentations, papers. The same graphic for each of them! Very economic workflow! Save all the transitions your graphics go through over time in Keynote, and you got a great narrative of the structure how your research interests and knowledge changed over the course of the research!”. Timeline – this software enables you to create 3D timelines that you can incorporate in Keynote presentations. It’s icing on the cake stuff – but real quality icing that gives a real ‘wow factor’ to presentations. At around 50 pounds, its value depends very much on how much you do presentations – but once you’ve used it once, then you’re hooked. Easy to use, and its integration with OSX is good – enabling you to import timelines from iCal and other applications. The graphics are great. However, for me the clincher is the positive and human attitude of the two person operation that produces it. Buy and download the software, then wait to see what arrives in your letterbox a couple of weeks later. Papers – is what every researcher and student needs. It is brilliantly designed software that maintains your personal research library of PDFs. It helps you find them and download them, group them, create notes on them, and export bibliographies for End Note, etc. It costs 25 pounds, plus there is a 40% student discount. Papers and Scrivener are the two key tools that I use to pull my research material together and write it up. Like Scrivener, this is produced by people who once were researchers, and this shows in the power of the software and its ease of use. Just buy it. Mendeley – in theory is great. Imagine Papers mashed up with Last.fm so that you can link to other peoples’ PDF libraries. And the software is provided for OSX, Linux and Windows which you can download for free. The website gives you an online profile and a means of linking to all those other libraries out there, and the desktop application provides what Papers offers – but just not as well. For example, you can’t print. Now, call me old fashioned and an irrational fan of stuff on bits of paper, but I’d say that’s a fairly key limitation of the software. It also crashes. I don’t want to be negative, and I’m sure that future versions will overcome these limitations, but having worked with Mendeley and Papers in parallel for a time, Papers is by far the better application. I hope that by the time I update this, the Mendeley people will have closed the gap. Freedom – the biggest barrier to doing stuff at your computer is doing stuff online. Emailing, messaging and constant online access is the enemy of concentration. This great donationware utility simply disables all networking on your mac for up to 8 hours. Turn it on, and you get stuff done. Simple. There are now many on-line tools out there to support research and to facilitate collaborative working. Writeboards are, according to the site, “sharable, web-based text documents that let you save every edit, roll back to any version, and easily compare changes. Use Writeboard to write solo or collaborate with others.” It appears a very useful tool to collaborative writing. And it’s free. Perhaps most powerful is SubEthaEdit. It’s not a webapp, but a mac-based software tools that enables collaborative writing using ichat or similar. There are flexible alternatives to Outlook/Entourage that allow on-line calendars to be created and shared, like Google Calendar. Just google it. Doodle “is a web-based meeting scheduler. It is used to find suitable dates for appointments with other people. No registration is necessary. This makes Doodle particularly useful for people who do not use a common calendar or groupware system. Doodle can be used to find dates for meetings, dinners, cinema, events, and so on.” I use this often. It works. A problem with collaborative working can be document size as many mail servers do not allow attachments larger than 5Mb to be mailed. So uploading a large file to a temporary hosting service is very useful. I use YouSendIt which is free to use, fast and reliable. 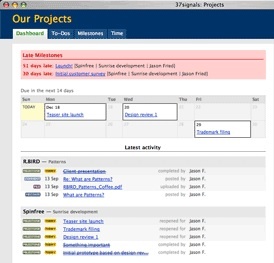 Basecamp is the Scrivener of project management. All your notes, files, communications, timelines get put in this online tool that all your partners can have access to. It provides a clear and secure focus for all communication on a project. I use it to co-ordinate a project with partners in a number of different Universities, while I am also a partner in another basecamp co-ordinated project with partners throughout Europe. After you’ve used it for a week you’ll wonder how you managed without it before. There’s a free service that allows you just one project but no file sharing. Try it. The simple issue here is: do it. If you don’t then at some point all will end in disaster. I know. Some people backup on a nightly basis, others weekly. What you need is an external hard drive, the prices of which continue to fall and which you should currently be able to get for around 50 pounds (unless you have a lot of video data, in which case you need something bigger). iBackup is a neat shareware backup utility. I’m a new mac user and a graduate student starting my thesis. What a helpful site to stumble upon. I will pass this along to other researchers in need of some freeware tips. Thanks a lot for collecting and sharing all this information! There is just one more I would add : prezi . It’s available for pc and mac (webapp) at http://www.prezi.com and is free for academic use. It has given me a huge boost in my approach to presentations; It’s the ultimate antidote to powerpoint (or keynote). what a pity that there are so many tools that only available for mac! I am a first year college student, so not a lot of experience with research papers. can someone suggest an app? I am reading and highlighting a text on my kindle….or even on a kindle app that is on my Ipad. Normally I would just copy these highlights onto file cards and then sort them as I plan my outline. I know I can avoid the writing step by copying and pasting the highlights into some app like post-it notes….but I want to avoid the cut and paste for all of my quotes. Is there any way to I can just highlight and then the highlights are automatically put on *cards*?….electronically? does notebooks or evernotes or scrivener work with kindle? Ipad texts? which further means ever increasing fatty deposits and high rate of obesity.